Here is an image captured from the internet of a Selig Chair. I mentioned in a previous blog that an interior designer contacted me to see if I’d be able to make a seat insert for a chair, recliner, and ottoman for a client of hers. They now had pieces of plywood in them and, needless to say, were no longer as comfortable as they should be! Upon meeting at the clients house and inspecting the chairs I thought it was a doable project but we also noticed this badge which led me to do some internet research. 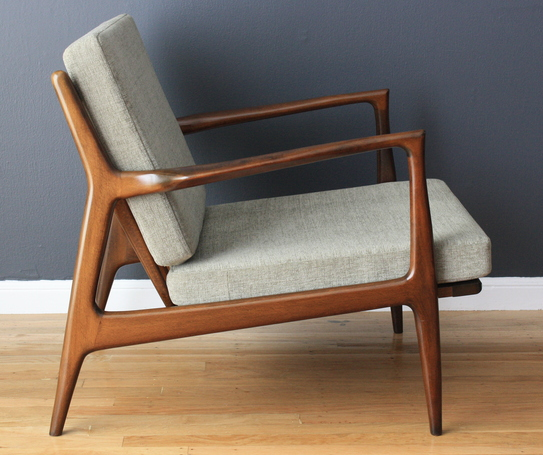 These chairs were produced in Denmark and this particular style is from the early 1950’s. Those of you who are woodworkers can probably see some Sam Maloof design characteristics in this chair. The sculpted arms and joinery is a signature feature of Maloof’s work. Having read quite a bit about the history of Sam Maloof and his evolution in furniture making I’d suppose that this chair could have influenced his work too. Here is a LINK to Sam Maloof if you’re unfamiliar with him. I would say that he’s among the top 10 contemporary furniture makers. Although he has passed on his legacy continues with his family and co-workers and there is a museum dedicated to his work in So. California. As for the Selig chair, here’s a LINK with some information about them as well. They are now collectable examples of fine furniture, made with quality materials and joinery techniques that have them last for decades. Unfortunately we can’t say the same about the furniture offerings in most so called furniture stores today but I don’t want to get on that soapbox! One of the best things that came from my research is discovering that these chairs used a webbing system called Fagas Straps. These are a rubberized strap with brackets attached at either end. This bracket will attach to a groove cut in the seat bottoms. There is one company I found that still imports theses directly from Denmark so I ordered enough to do both chairs and the ottoman. I was a bit leery of how long it may take but received shipping notification this weekend that they’re on the way via USPS, 2 day shipping. I suspect that the company I ordered them from makes these up as people order them cutting the raw strap material to length and then attach the brackets. If you’re reading this and need the straps they are the Evans Company out of San Diego. They don’t have the spiral bands for the backs though, these are in good shape and all there. Finding these straps will make the job much better, restoring the chair to its’ original condition rather than modifying it with an insert and conventional chair webbing. I’m going to use the word “refurbish” rather than restore because I feel that’s what I’m doing with these chairs. I don’t consider myself qualified to be called a furniture restorer and I’ve seen enough episodes of The Antiques Roadshow to know that an amateur job on a piece of furniture can really affect the value of it in a bad way. The client told me she wanted to have the chairs cleaned up but did not want to lose the patina and character they have. After all, these chairs represent over a half a decade of family history. She mentioned that the recliner is one where one of her relatives would have his nightly cocktail! All in all, they are in very good condition. There was some type of white paint spills on each of them and a few chips near the bottom of the legs, probably from vacuum cleaner collisions. You can see normal wear on the front of the arms and backs but nothing real obvious, just a lifetime of usage. Back completed, some wear here. I have the recliner to finish the refurbishing on and it’s really interesting how it operates. If possible I’ll attempt to photograph that and share it with you. I’m confident that re-strapping the chairs will be a relatively simple procedure — time will tell. This entry was posted in Uncategorized and tagged BriWax, collectable furniture, Danish modern furniture, Evans Company, Fagas Straps, Sam Maloof, Selig Chair. Bookmark the permalink. John thanks for sharing. I have a very similar chair I bought years ago for cheap and decided to refinish it. Soon after I started stripping it I knew I made a mistake. I plugged on and got pretty good results, except the logo cross emblem got destroyed by the stripper. I had it reupholstered and that fabric didn’t turn out so well [It has sides that hinge and open when you take the chair apart plus the cushions]. I still love it and want to preserve it better. I have some mold that has grown on it, and am wondering if that has anything to do with the protective finish I put on [I don’t think I did enough layers, Any thoughts? i understand there’s more of a mold in the house issue] Also the webbing I have never replaced and have considered alternatives but it has never been able to support a person [a cat or two though] I will try the Evan Company thanks for, the link. I have these same chairs but my finish looks dark and shiny. Any ideas how to knock down the shine. I so want to refinish but have heard claims from others not to do it. Do you know what kind of wood they are? I’m not sure as to the wood type of these chairs. I’m a big fan of using wax and a white Scotch pad as a final finish on furniture and picture frames. If you check my last blog on these chairs: https://woodworksbyjohn.com/2015/10/22/chair-is-complete-education-ongoing/ you’ll see I used BriWax. My preference is to use Liberon Black Bison because BriWax has more solvent — that being said if your chair are dark and shiny the BriWax is probably the best choice to clean them up without removing the original finish. Like they say though “check first in an inconspicuous place”!